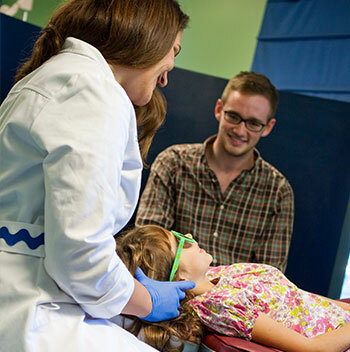 Pediatric Dentistry of Savannah embraces parental presence during the appointment. Having parents involved in our initial visits enables our team and Dr. Cara to review over medical history, teach brushing/flossing techniques and to discuss any dental issues directly. Your role as a parent is essential in preparing your children for their dental visit. Speak with them about coming to the dentist as a positive experience-never use it as a punishment. "I won't let the doctor hurt you,"
As they may cause unnecessary anxiety. Keep in mind that if your child is scared and crying, this is normal. At Pediatric Dentistry of Savannah, we specialize in dealing with these situations and will work on developing a special relationship with your children, even if it takes more than one appointment to earn their trust.